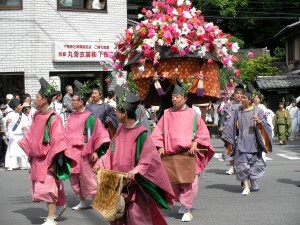 The festival is for two shrines of Kamikamo shrine and Shimokamo Shrine both of which are in Kyoto. The main part of the festival is a parade of more than 500 people clad in period costumes of traditional Japanese priests and nobles. The symbolic figure of the parade is Saio-dai(/斎王代, acting head priestess of the two shrines) and this time a 20- year-old female collage student was appointed as the 58th Saio-dai and showed up in the decorated float-sedan in the parade. 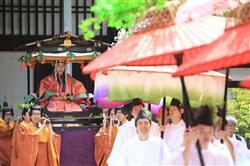 Other sacred events followed the parade and tea ceremonies were held for the visitors in the shrines. Kumihimo is a Japanese form of braid-making. Cords and ribbons are made by interlacing strands. 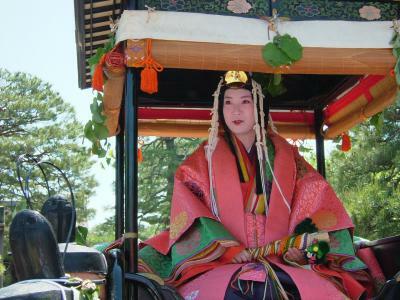 According the Kyoto Shimbun paper, Kyoto Prefecture, Kyoto City, and the Kyoto Chamber of Commerce and Industry are considering a petition to make Kyoto into a “special content zone” to promote local production of films, anime, and manga. As such a zone, the area may receive special economic or other laws that replace nationwide laws to aid the development of local content industries and encourage foreign involvement. The Kyoto International Manga Museum (京都国際マンガミュージアム) will display works by three North American manga-inspired artists from January 5 to February 5. This is the first time art from North America will feature in an exhibit at the museum. Admission to the “Manga Style ― North America” exhibition will be free, however, a general admission ticket for the museum will be required. 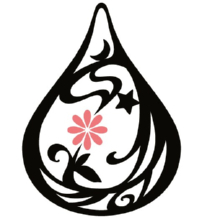 “Manga Style ― North America” will include about 80 works by the superhero comics artist Takeshi Miyazawa, young men’s manga-style artist Felipe Smith, and the shojo genre artist Svetlana Chmakova. Several color panels and about 24 black-and-white pages for each author will feature with other materials in the exhibit. Miyazawa and Smith, both current residents of Japan, will also participate in a discussion about manga and manga-style works produced in Japan and North America.